Beaded jewelry isn’t just about wearing a pretty adornment. We’ve been noticing a big trend in healing stones this year. It can also be something that concentrates your focus or contributes to your well-being. So, there’s absolutely no guilt in treating yourself to a healthy dose of inspiration. The easy beading projects in the Fast & Fabulous: Rough Gemstones pattern pack are good and good for you! Ancient Egyptians used healing stones such as amethyst and quartz — and those stones are still popular today. There are several projects that use quartz in this collection, which should come as no surprise. In addition to being very trendy, quartz is a good all-purpose healing stone and it’s available in a wide variety of shapes, sizes and colors. You’ll also find projects using chalcedony, turquoise, citrine, dravite, amethyst, and other rough gemstones in this pattern pack. There are nine beautiful beaded jewelry projects using shards, nuggets, spikes, rough-cut slices, and more gorgeous rough gemstones in this colorful Fast & Fabulous collection. The color palette is a combination of blues and greens, coral, purple, and topaz. These delicious designs are perfect for spring and summer. Your favorite Fast & Fabulous designers contributed projects to this collection: Debbie Blair, Stephanie Fredin, Sandra Lupo, Kristina Hahn Eleniak, Michelle Mach, Anne Perry, Terry Ricioli, and Michelle McEnroe. 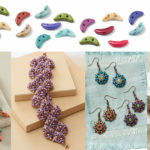 These easy beading designs use simple techniques like stringing, crimping, wireworking, and knotting, so you can keep it low-stress. Whether you’re getting started beading or looking for quick projects, you’ll find lots of tasty inspiration. Place some healing gemstones (affiliate link) around you and get started! Read Healing Beads: The Special Meanings of Gemstones for advice. Here are some fresh picks from the collection. Living Coral is the Pantone Color of the Year, and it’s fun to see it interpreted in a variety of different ways. 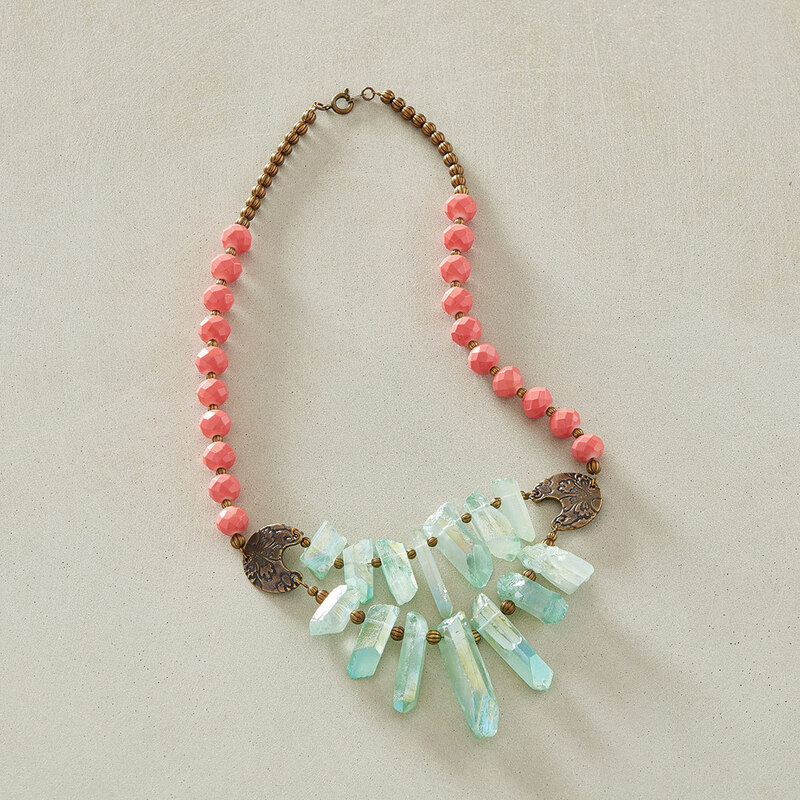 Crystal Palace by Debbie Blair combines rough crystal quartz shards with floral patterned components and coral glass beads for a look that’s both edgy and feminine. The quartz shards really make a dramatic statement, plus, they can be used to clear the mind and bring the body into balance. The double-strand focal section works well with a variety of necklines. I love the Carnelian Comet by Stephanie Fredin. It uses the Color of the Year and it’s exactly the style of necklace I like to wear to dress up a T-shirt and jeans. This version combines a chunky stone bead with sparkly beads and chain for a striking, on-trend accessory. 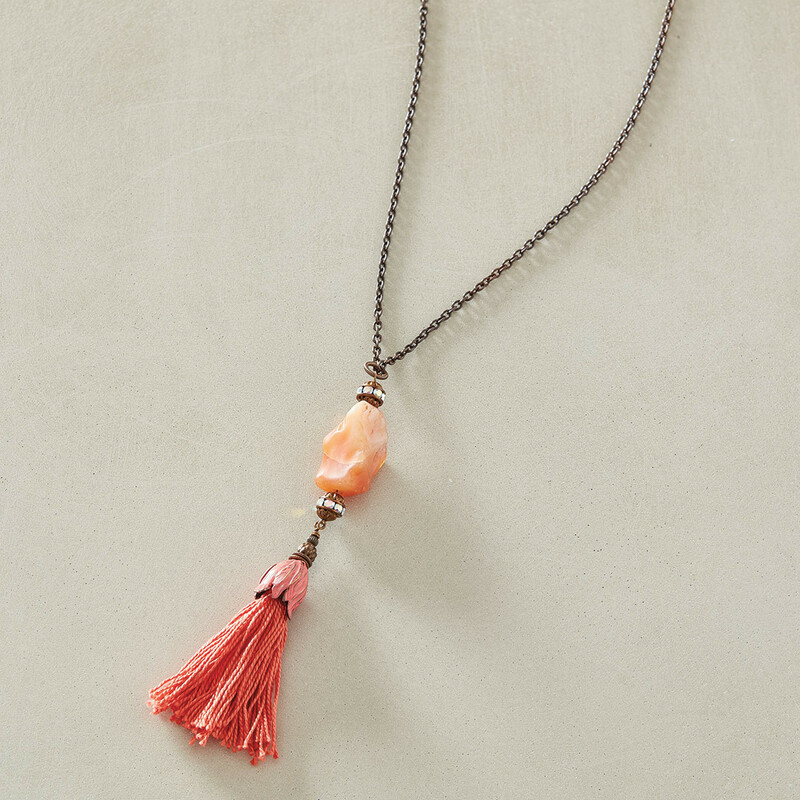 Make your own tassel and top it with a hand-painted tulip-shaped topper for a DIY design that looks like you found it in a boutique! If you’ve never tried Vintaj patina ink before, then this is the perfect excuse. Nature melds amethyst and citrine to create ametrine, which is mined in Bolivia. This unique stone offers balance and harmony to the wearer. 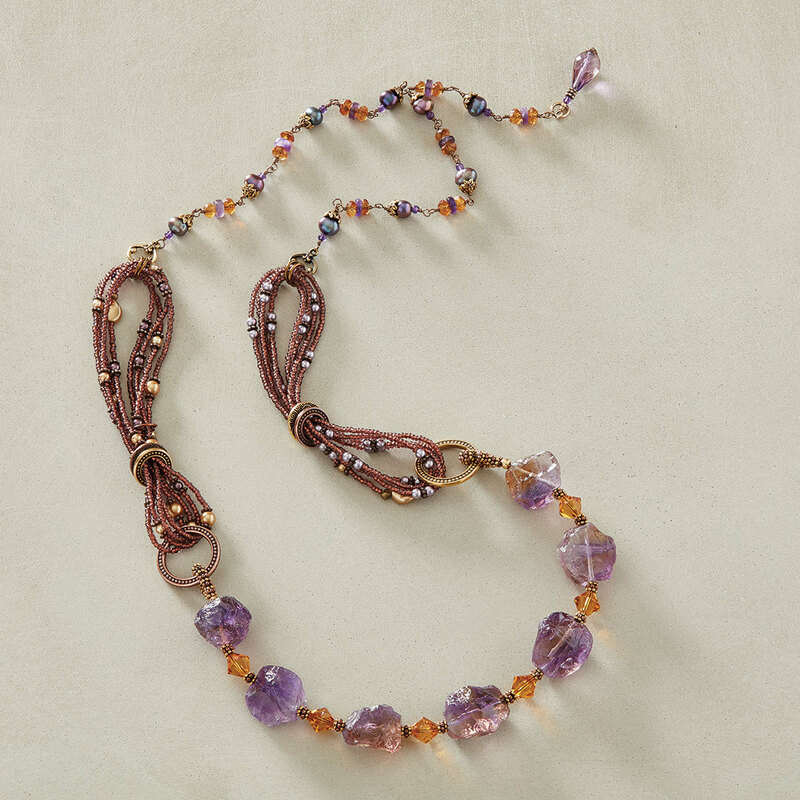 Sandra Lupo designed the Gems in Harmony Necklace in three different sections: a strand of chunky rough gemstones in the front; loops of seed beads on the sides; and smaller wire-wrapped beads at the back. It’s so clever how she uses TierraCast rings and toggles to make the connections between the sections: They’re lovely while serving a practical purpose. 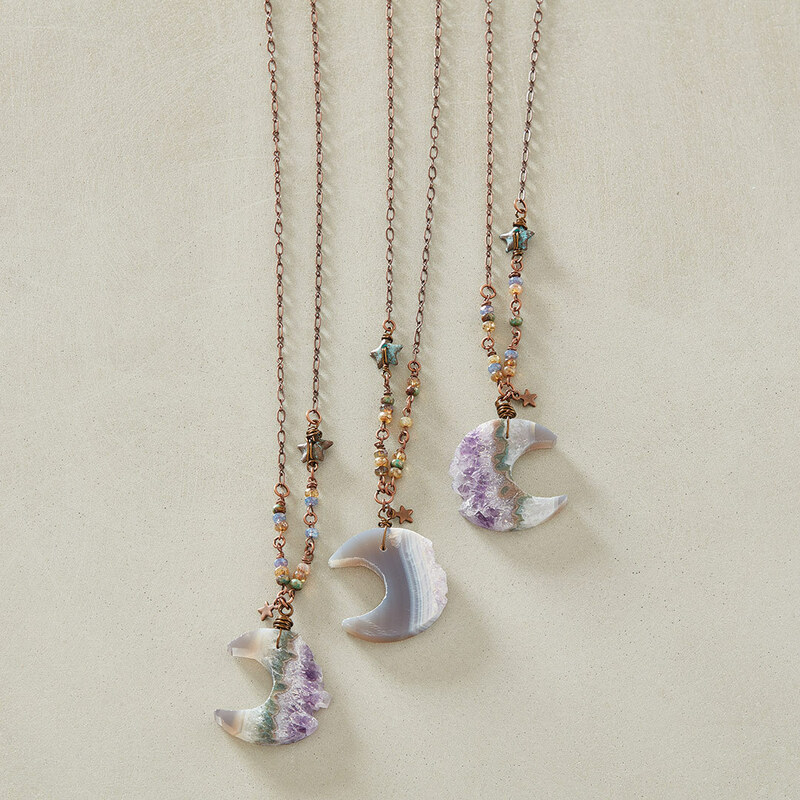 Leonardo Da Vinci inspired Kristina Hahn Eleniak to create her Under an Amethyst Moon Necklace. He once wrote that amethyst holds the power to dissipate evil thoughts and quicken one’s intelligence. This celestial piece showcases a beautiful carved amethyst slice surrounded by earthly beads, copper elements, and a verdigris star for a truly mystical design. You’ll use basic wireworking to connect the elements together, so you can easily substitute beads to make your own statement. The rough spikes in this necklace are made from a stone called dravite. It was originally discovered in Austria. It is also known as brown tourmaline or champagne tourmaline and is believed to have a soothing effect on your heart, mind, and body. 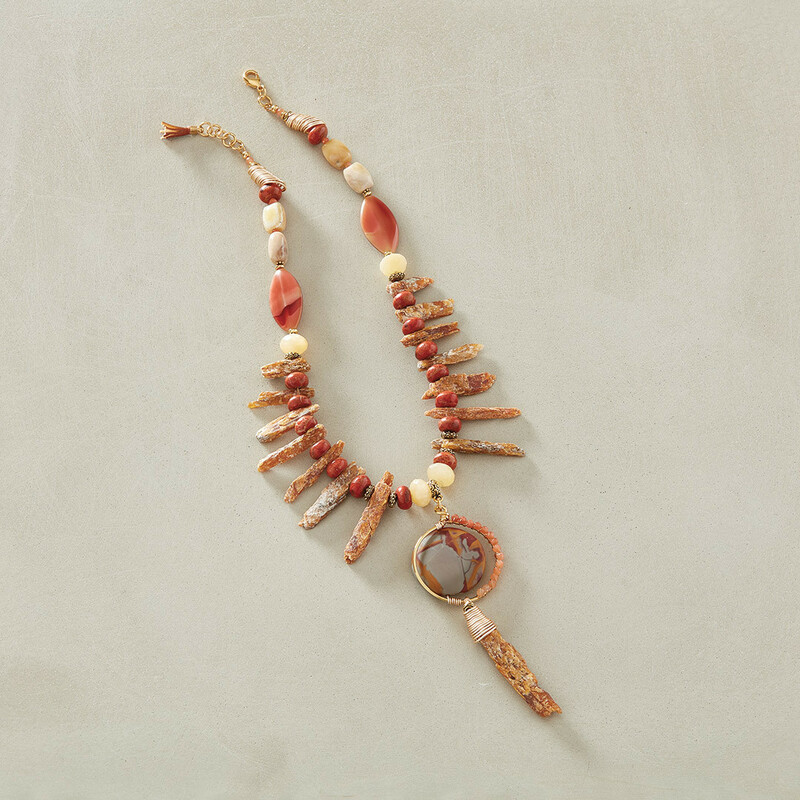 Wear this striking Roughing It Necklace by Sandra Lupo when you are under stress or simply want to make a bold statement with rough gemstones. Sandra finished the ends of this necklace with coiled wire cones made using the Conetastic Tool she invented. Add drama to this citrine Two to Tango by Michelle Mach by attaching a second removable citrine pendant. 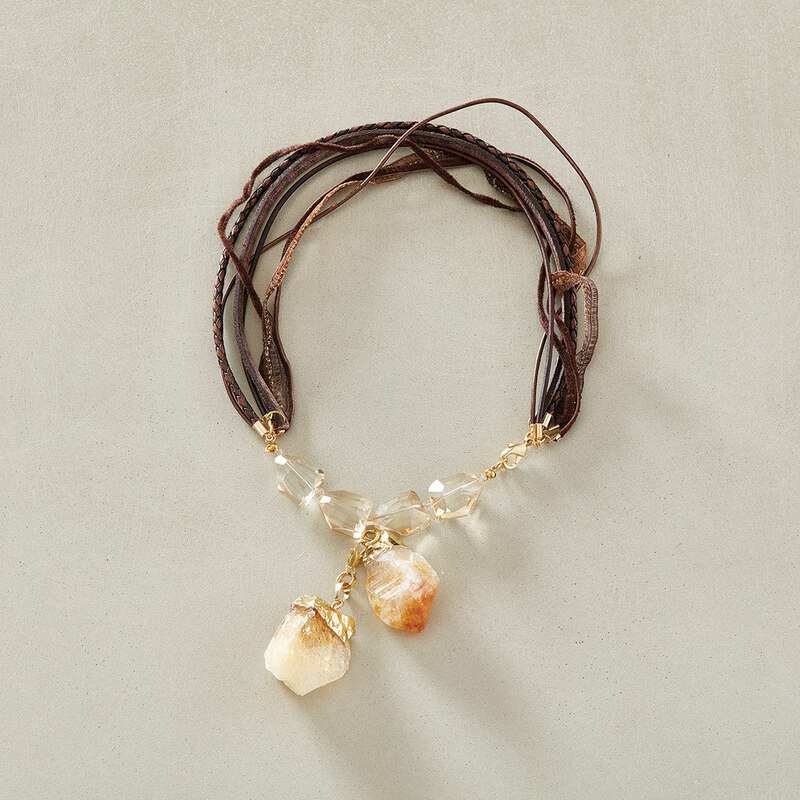 One of the attributes of citrine is inspiration, which makes this necklace a perfect project to make and wear. The mix of leather and ribbon with subtle metallic elements echoes the sparkle in the glass and crystal beads. You could easily change-up the look of this necklace by substituting your own stones or another chunky pendant at the front. Havasupai Falls by Anne Perry is an eye-catching ode to the Southwest. 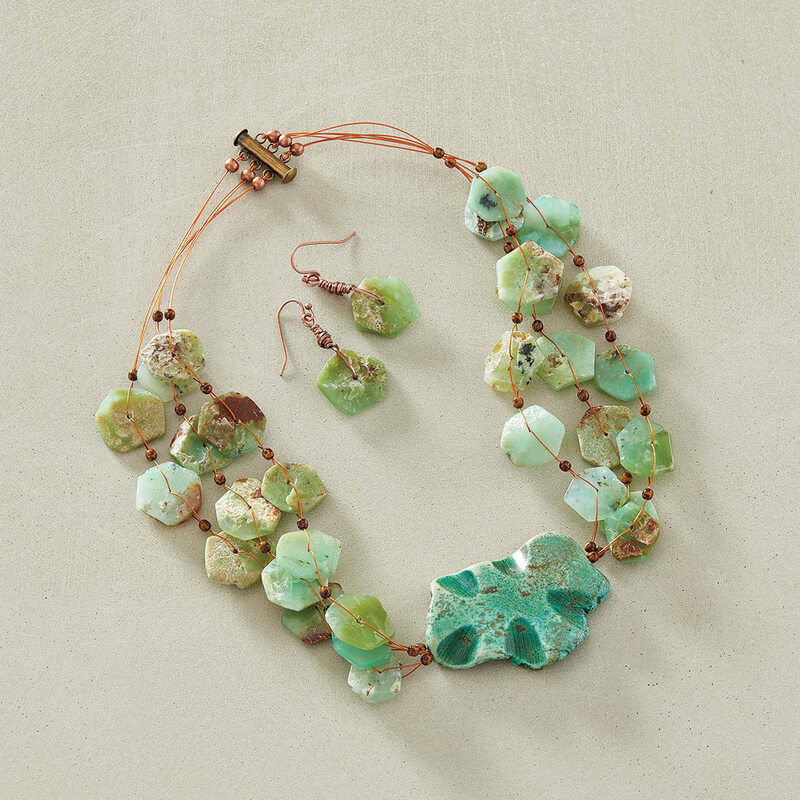 Like the waterfalls of the Grand Canyon, this necklace balances the roughness of rock with fluid, sparkling green hues. The stones are chrysoprase and turquoise, which are both good for mental health. They’re known for lifting the spirit and bringing a peaceful sense of calm. This technique looks complex, but it’s really easy to do. You might try it with buttons or other disc-shaped beads. 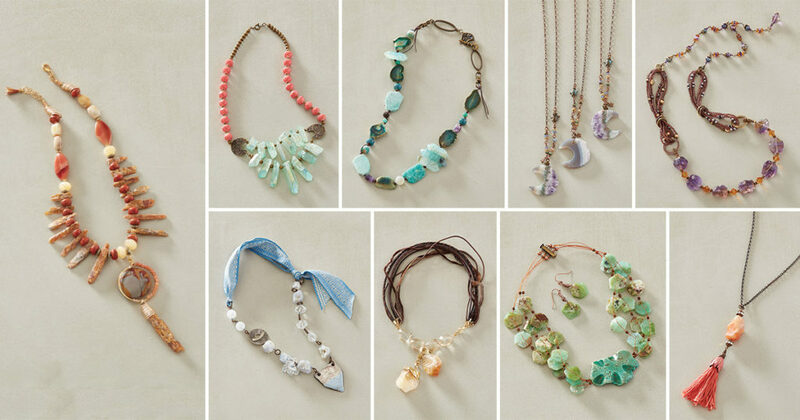 Capture the colors and moods of the ocean with this easy, knotted Ocean Moods Necklace by Terry Ricioli. Pale aqua stones evoke crashing waves, teal and turquoise suggest deeper waters, and various greens symbolize tide pools. 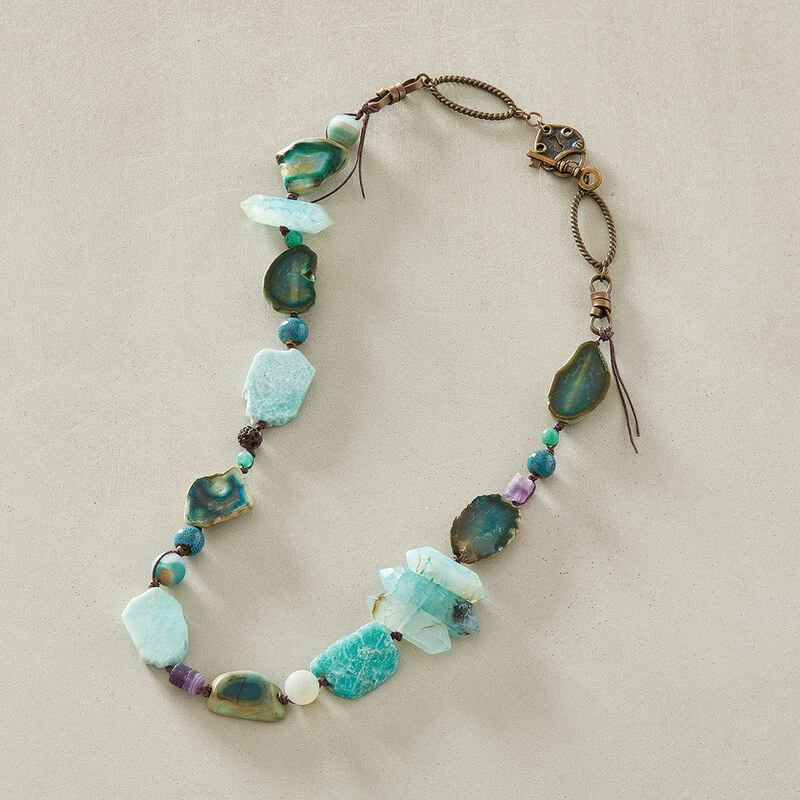 It’s a peaceful mixture of gemstones: agate, fluorite, and amazonite. Agate is a good stone for overall balance, while fluorite helps clear the mind. Amazonite can be a helpful stone for people seeking to identify their authentic selves. Winter’s colors and textures are echoed in this unique asymmetrical Stormy Weather Necklace designed by Michelle McEnroe. Rough chalcedony, clear quartz nuggets, and a hint of blue glaze on the pendant combine to evoke images of ice and snow. 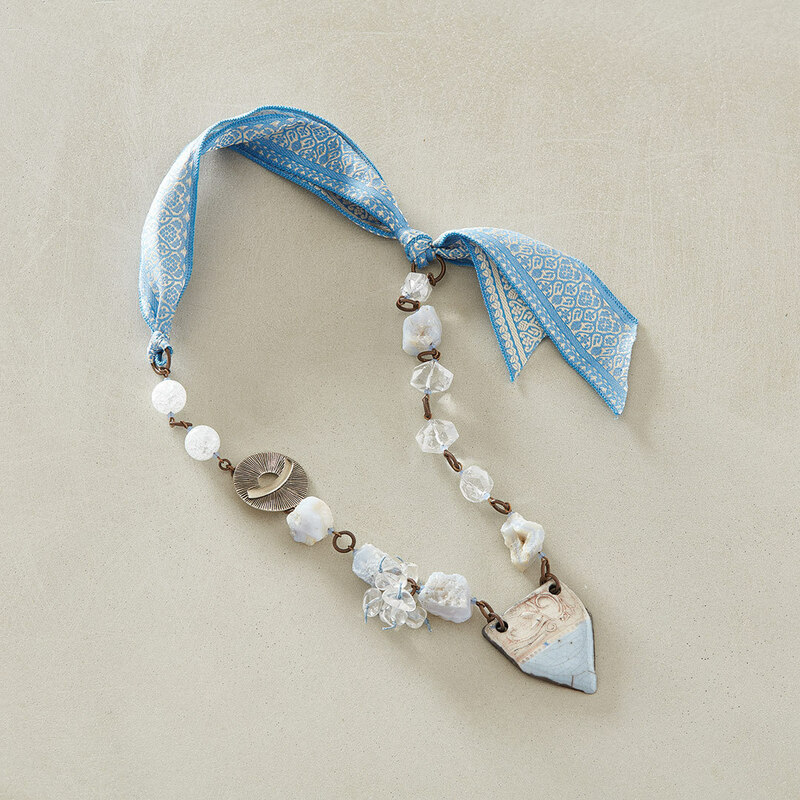 The vintage sari silk ribbon gives this necklace a lovely, handcrafted look. Chalcedony is a form of quartz, so it has the same attributes as the “master healer” stone. It also stimulates creativity and harmony. My favorite thing about the beading designs in Fast & Fabulous: Rough Gemstones is that they’re stylish and meaningful. Making them can be a meditative practice in itself. Plus, the stones have different qualities that can contribute to your well-being. And, if none of that is really your bag, then you still have nine gorgeous necklace ideas to kick your accessory wardrobe up a notch.